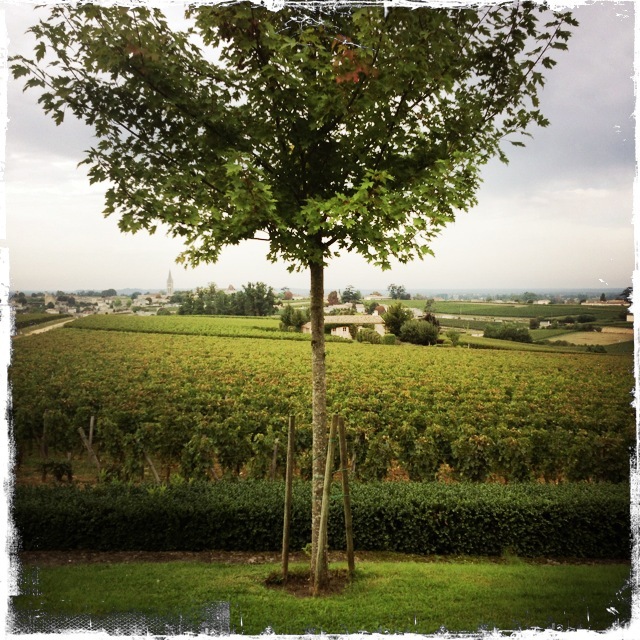 After spending the morning exploring St. Emilion, we headed out to Chateau Troplong Mondot for our first tasting of the day (a tasting after 10:00 am – what was the world coming to?? Ha.). We had scheduled lunch in their restaurant at the Chateau, the lovely Les Belles Perdrix. 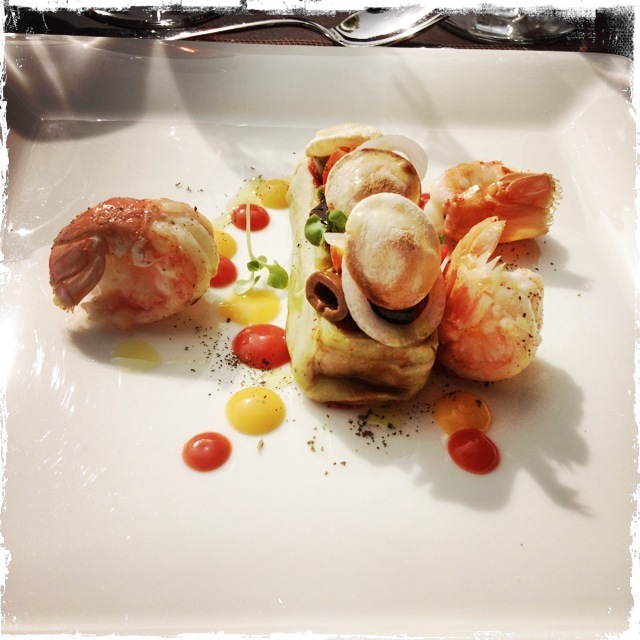 This was a truly amazing meal in a fantastic setting – we highly recommend it. 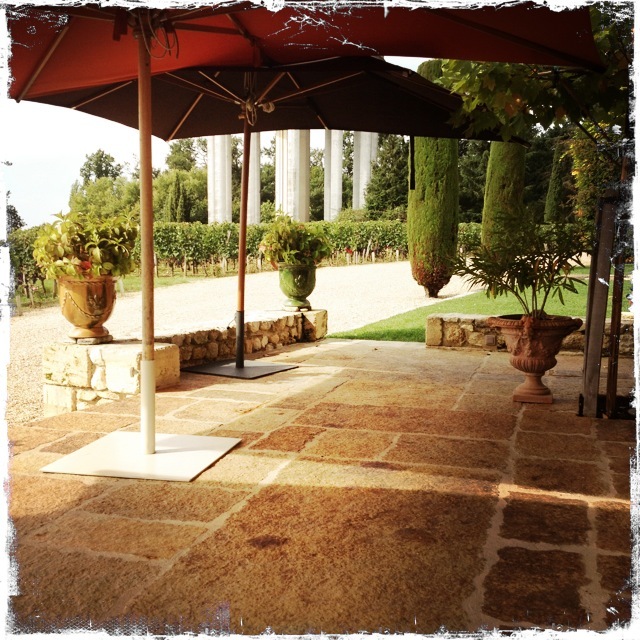 It had a bit of a Tuscan feel to the place – sort of laid-back and elegant all at once. 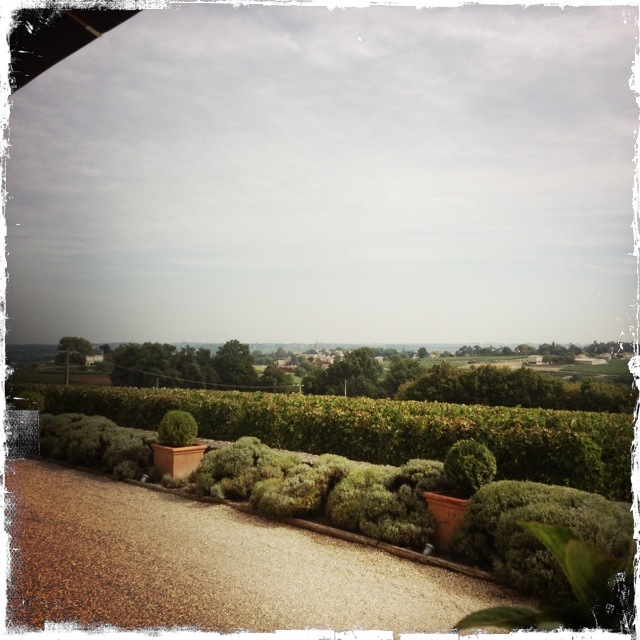 Restaurant Les Belles Perdrix at Troplong Mondot overlooking the vines and the Dordogne Valley. Part of the view from our table. The food was anything but laid-back though. 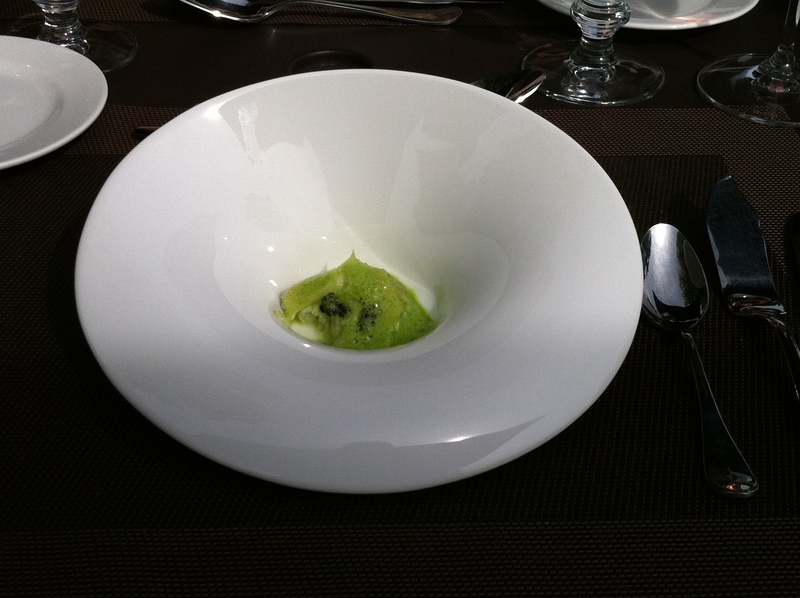 The chef at Les Belles Perdrix was turning out some serious food – seriously good food, that is. 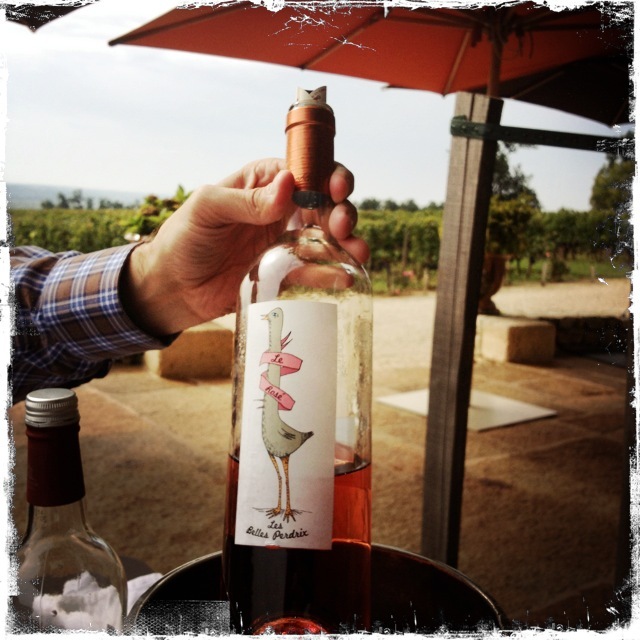 We had a little fun with our wine selection as well – the rose was one produced at the Chateau primarily for the restaurant’s use – it had a charming label and was a great compliment to our meal. Some sort of foam with caviar starter. I started it before I remembered to take a picture of it! Pressed tomatoes from the garden with cottage cheese and basil, “snacked” tails of Dublin Bay prawns from Britany, souffle bread and black olives. So good. 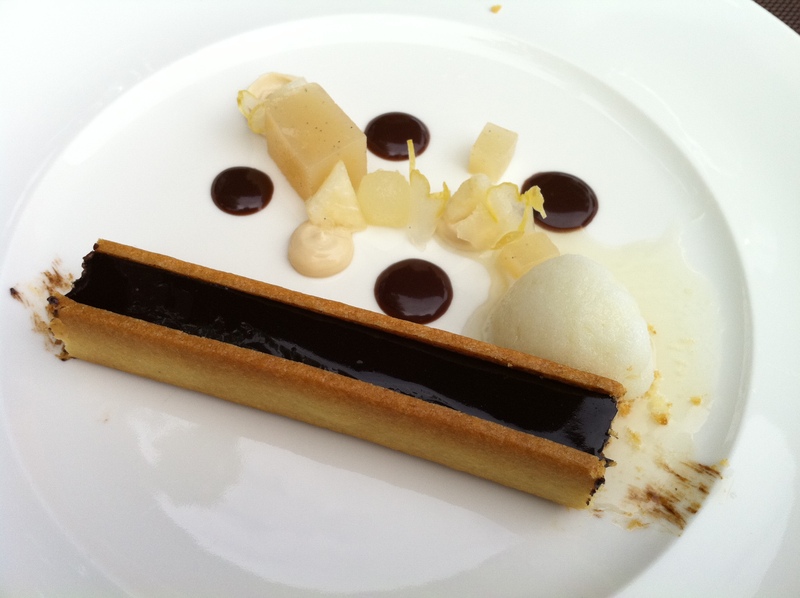 Creamy Guanaja chocolate with crunchy hazelnut “praline,” slow-cooked Williams pears and lime sorbet. The Les Belles Perdrix rose. NV Le Rose – Les Belles Perdrix – A deep copper color, nice red berry fruit, very dry with just a hint of sweetness. Very good acid and a nice smooth mouth feel. A medium length clean finish of red berry fruit. Very enjoyable and refreshing on a summer day. After lunch, we walked around to the side of the Chateau and met up with our guide. 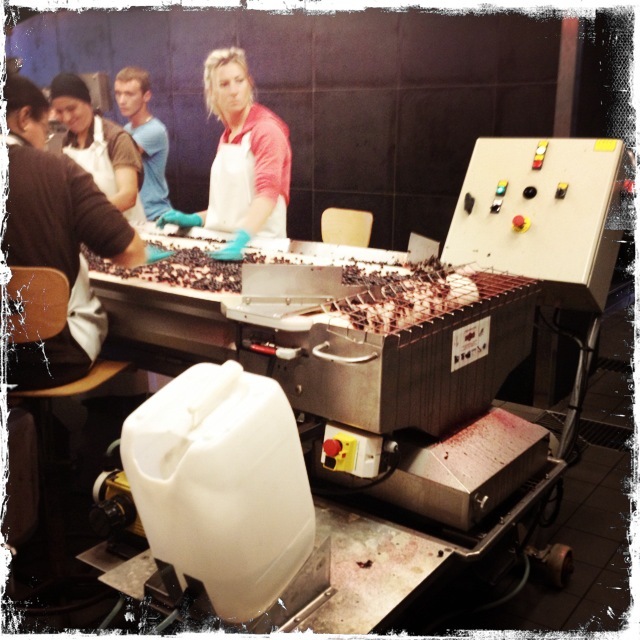 Troplong Mondot was one of the first red wine estates we had visited that was harvesting during our tour. It turns out the right bank was harvesting a little earlier than the left. 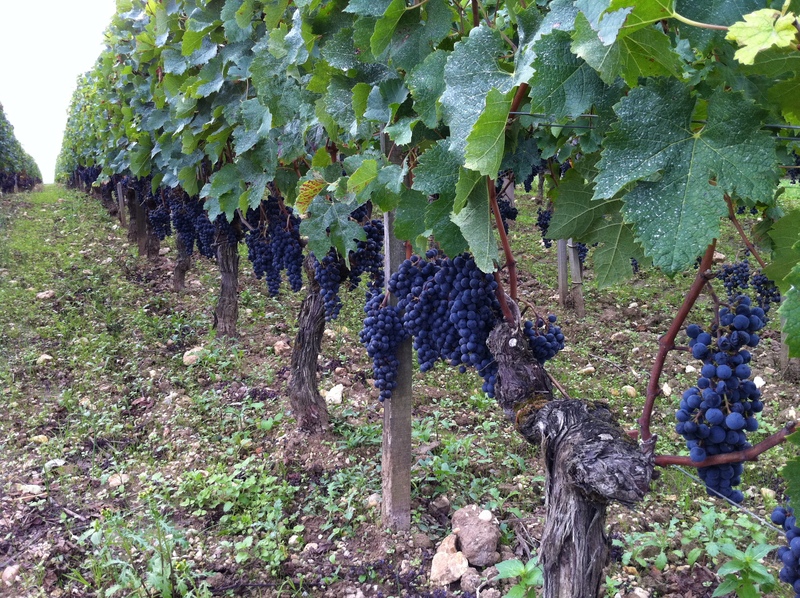 Even as novices, we could easily see that the vines were just bursting with ripe grapes. 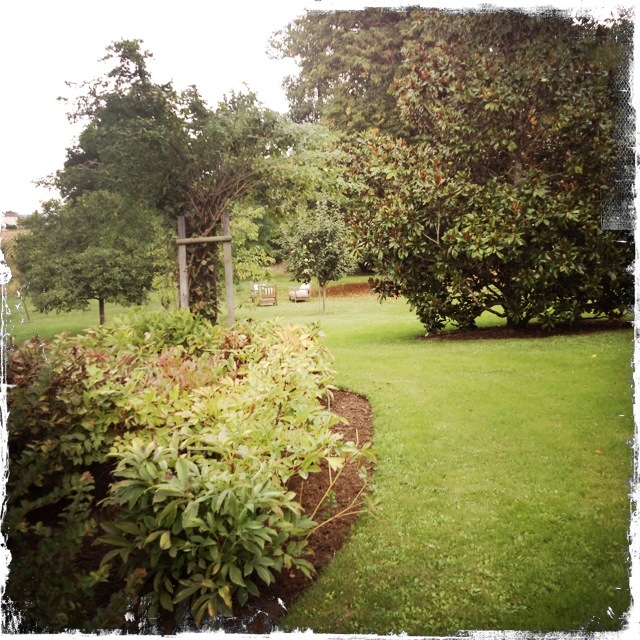 On our way to the winery, we stopped by the gardens of the owners of the estate and took in the views. The estate, with it’s 33 hectacres, sits on the top of a hill; the gentle southwest slope overlooking the village of Saint Emilion and the sharp south-facing hill which extends to Chateau Pavie. The vineyard is planted on this plateau where it has optimal sunlight and excellent natural drainage. The average age of the vines are thirty years old, planted in a limestone clay soil enhanced with sedimentary fragments of flint and chalk, which they believe adds to the quality of this terrior. Their vineyards are planted with the Merlot that is the primary varietal of this region and the most widely planted. 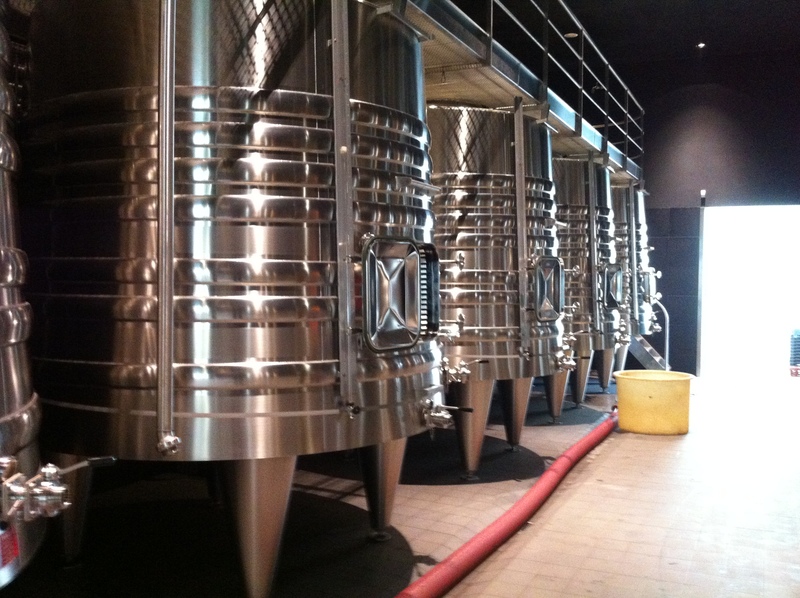 This is what gives the power and structure to the wines of the right bank. Most of these wines are blended with Cabernet Franc and Cabernet Sauvignon to bring depth and complexity to the wines. 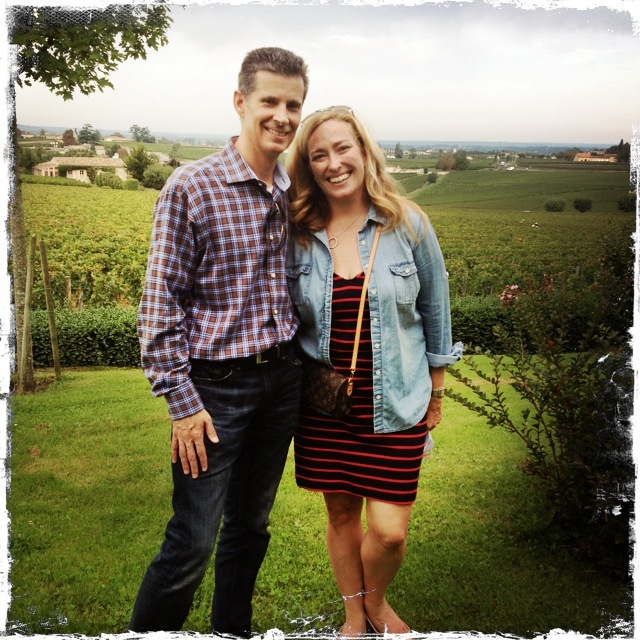 Bob and Christina Watt at Troplong Mondot. 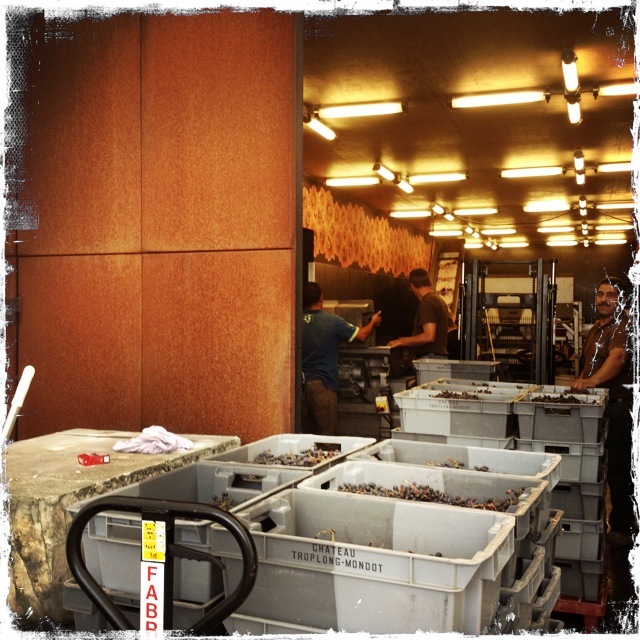 Here’s a bit of the history of Troplong Mondot, as told by the estate. In the beginning, the Mondot estate belonged to one of the most prestigious aristocratic families in Gironde: the de Sèze family. In 1850, Raymond-Théodore Troplong acquired Mondot. It was Edouard Troplong who, at the death of Raymond, inherited the vineyard. Following a trend at that period, he added Mondot to his own name. Thus Troplong Mondot was born. At the beginning of the 20th century, Alexander Valette, a wine merchant in Paris bought the property shaped by its previous owners. His son Bernard, inherited the estate, then his grandson, Claude, took over the property. In 1981, Claude Valette entrusted the destiny of the vineyard to his daughter Christine. 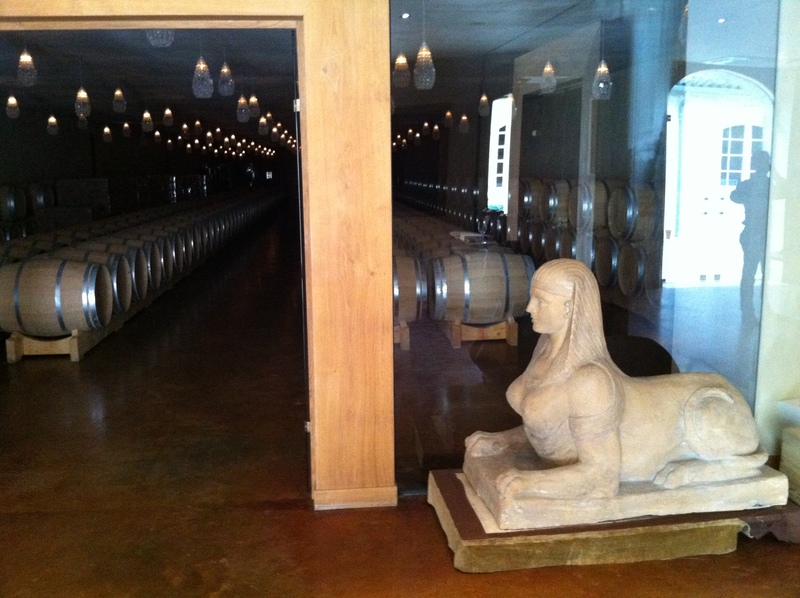 Soon joined by her husband, Xavier Pariente, they have worked tirelessly to continue to improve the quality and the reputation of their wines worldwide. In 2006 Troplong Mondot became a Premier Grand Cru Classé. 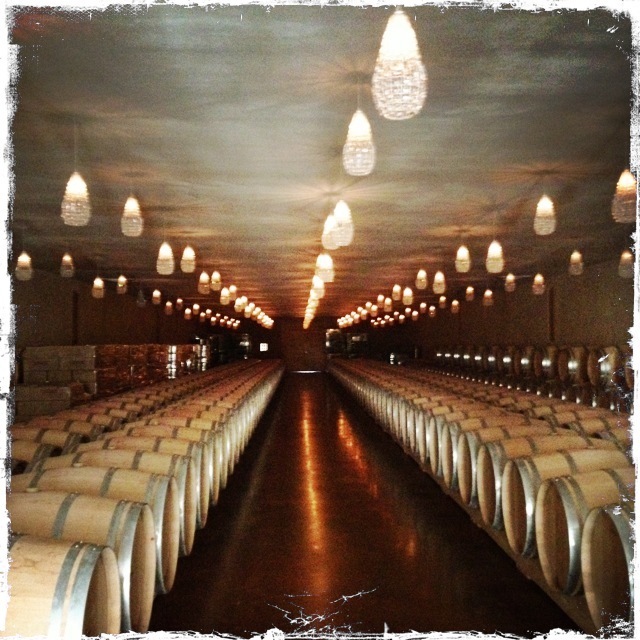 Christina’s friends at home would’ve loved the chandeliers in this tasting room. I thought the sphinx was pretty cool too. 2006 Troplong Mondot, St. Emilion – Absolutely beautiful nose of small dark berries, chocolate and subtle spices. In the mouth, deep dark rich blackberry fruit, chocolate, some spice and minerality. Very good acidity and a strong ripe very fine tannin structure. This wine has a very long dark fruit and tannic finish. This wine is still a very young, but it is excellent and will get better as it ages gracefully over the next decade and will drink well for two more decades past that. A wine to look for as a gem in the cellar.